Morocco is home to the highest mountain range in North Africa. The Atlas Mountains form several ranges over 2500km that stretch throughout Morocco, Algeria and Tunisia. 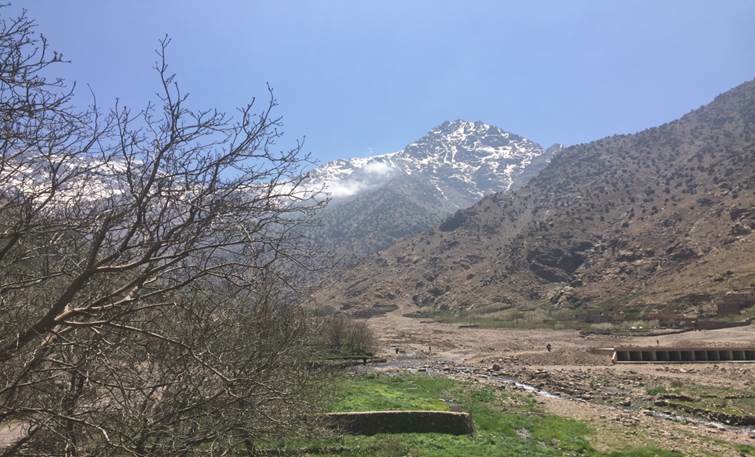 The range’s highest peak is Mt Toubkal which stands at 4167m (13,671ft) in southwestern Morocco affording amazing views over the Sahara Desert. Relax in the beautiful city of Marrakech after your trek. Meet your team and leaders followed by a kit check and team briefing in the afternoon. We have the option to walk into Imlil to purchase/hire any additional kit required. After we then relax and soak up the atmosphere with fantastic panoramic views of the Atlas Mountains from the roof top terrace. Today we begin our first days trekking by climbing up from our base up through the Tizi n’Tzikert pass at 2930m. We have the option to summit El Hadj at 3134m before we descend into the beautiful Azaden valley to reach the remote Tamsoult refuge. Here we will be greeted by our hosts with tea and coffee and if we are lucky some amazing home-made pancakes! After an early breakfast we set off by winding our way up through the beautiful Azaden valley. We pass via Cascade d’Irhoulidene and amazing waterfalls on route. Today is a proper mountaineering day with fantastic panoramic views of the High Atlas. 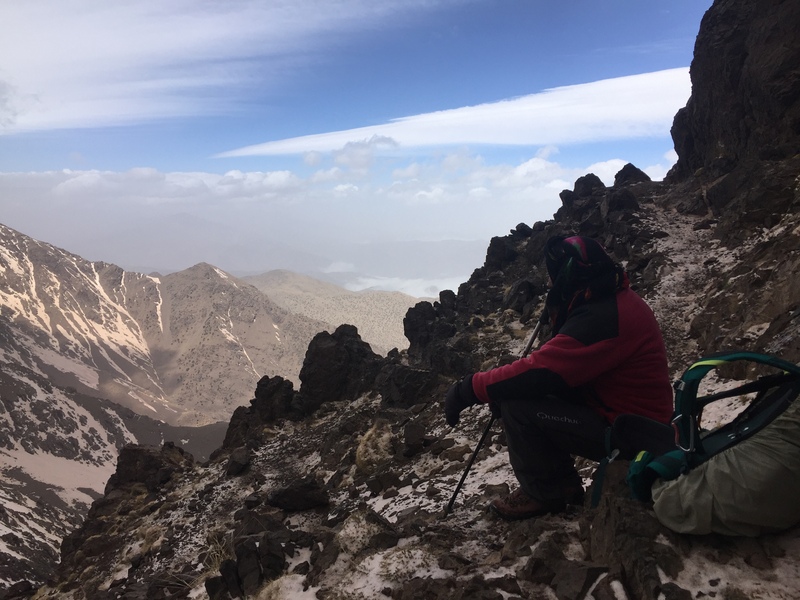 To further our acclimatisation we will summit Aguelzim South 3547m and Aguelzim North 3650m via the 100 ZIG-ZAGS before descending to our nights’ accommodation at 3207m at the foot of Toubkal itself! Today we have the option for a more relaxing start with a later breakfast if you wish. 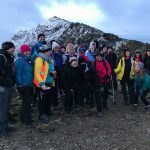 With many different acclimatisation walks on offer means we can be totally flexible to your needs and aspirations which may include bagging some of the peaks of the Ouanakrim. Good opportunity to see how everyone is feeling before the big summit attempt the next day. 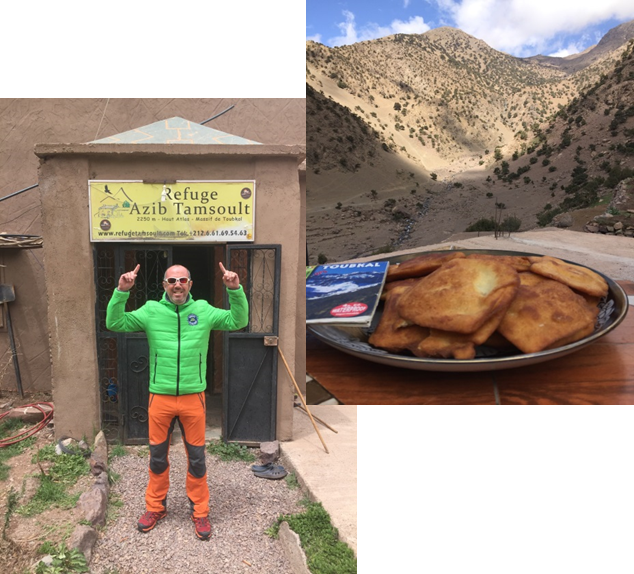 Option to just chill out at the Toubkal refuge, spending time relaxing and refuelling the body with food and water in readiness for the summit attempt. We can be as flexible as you require on this day! Toubkal summit day! HERE WE GO!!! Set your alarms early and enjoy a good breakfast as this is a tough day. We will do a final kit check before summit departure then head out to ascend via the south cwm which is the more popular route. This is a hard day but our previous days of acclimatisation should help us ascend the long scree slopes towards the summit. We will head to Tiz-n’Toubkal at 3940m before following the ridge line to the summit and the highest point in North Africa at 4167m with its large pyramidal iron structure and fantastic view across the Atlas range! We have different options for our decent back to Refuge de Toubkal and this can be decided on summit day. After a lazy later breakfast we head back down the beautiful valley to Aroumd. It is a long gradual descent so we take our time enjoying the views whilst celebrating our summit success whilst stopping to enjoy freshly squeezed orange juice at one of the many little rest stops along the way. Tonight we will go out for a team meal and enjoy some fantastic Moroccan food as we celebrate our past few days Atlas Mountains adventures! (please note evening meal to be purchased separately). After breakfast take in the main sites as you are free to explore the wonderful city of Marrakech and learn about the history, culture and architecture. Take time to explore the old part, within the medieval ramparts known as the Medina and also the modern French quarter known as Gueliz. In the afternoon we will depart for the airport and our flight home. Each day you will need to carry a day pack (25-35 litres) with everything you will need for the day. Additional kit can be put into a 75-100 litre Kit Bag (maximum 15 kilos) which will be transported by mules during the trek. Privately owned refuge by our in country trek provider. Shared dorms, toilets, hot showers and terrace view towards the Atlas Mountains. The Tamsoult hut is a renovated gite offering slightly upgraded accommodation. The gite is located in the picturesque Azzaden Valley in the summer village of Tamsoult at 2250m. Shared dorms, toilets and hot showers with amazing views of the Azzaden valley. Shared dorms, toilets, showers (not always hot), communal eating and relaxing areas, terraced views of the Atlas. Shared en suite Twin rooms. 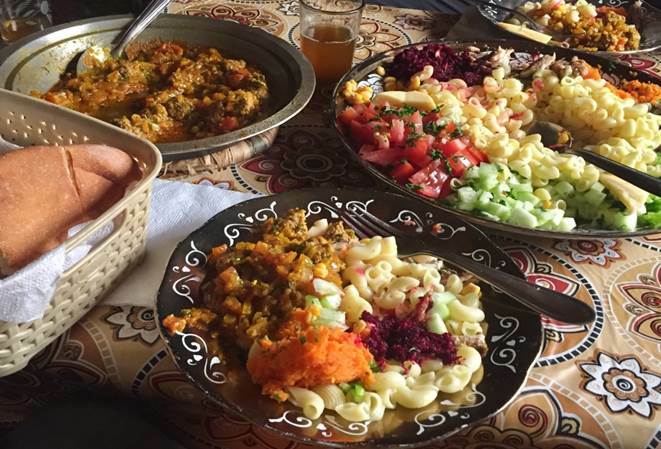 Fantastic home cooked food will be served every day whilst on the trek! Fully catered 5 day trek including water (need to purify), snacks, breakfast, lunch and evening meal. Breakfast will usually consist of homemade porridge with bread and jam with mint tea and coffee. Lunch will be bread, meats, fish and fruit with snacks whilst on trek. Your evening meal will be the famous Moroccan tagine of meat, vegetables with a fantastic blend of herbs and spices, complimented by the old wonderful Moroccan delicacy of cous cous. The Tagine will be served with fresh vegetables and pasta. If you have any specific dietary requirements please do discuss these with us so we can make sure we provide what you need. Bottled water is available at the start of the trek however we would prefer that you bring water purification tablets and use tap water (which is safe purified) to avoid plastic waste. British nationals don’t need a visa to enter Morocco for the purpose of tourism for up to 3 months. Your passport should be valid for the proposed duration of your stay in Morocco. No additional period of validity beyond this is required. Passports must be in good condition or entry can ne denied. There are no mandatory vaccination requirements. Recommended vaccinations are: Tetanus, Typhoid and Hepatitis A. However we recommend that you visit your health professional at least 4 to 6 weeks before your trip to check whether you need any vaccinations. Most major credit cards are accepted in the larger towns. ATMs are widely available in cities and most of the main towns. There is no limit on the amount of foreign cash you can bring in to the country. You won’t be able to change Scottish or Northern Irish bank notes and it‘s very difficult to exchange travellers’ cheques. The most important thing you need to know is that the Dirham is non-convertible, which means you can’t bring it into or out of Morocco. If taking sterling ensure that the bank notes are of good quality, not ripped or marked by pen. Ramadan runs from 5th May – 4th June 2018 – During Ramadan, our local guides and drivers choose to work. However, the energy levels of our staff and some local guides may be a bit lower and that some restaurants may be closed during the day. There is no time difference between Morocco and United Kingdom. This 5 day trek is a non-technical ascent but offers many challenges due to the varied terrain, daily height gain and the altitude. We advise that you have experience of (and be comfortable with) long ‘back to back’ walking days in mountainous regions such as Snowdonia or the Lake District. A good level of fitness is important and you may need to undertake some training before attempting this 5 day trek. You need to be confident of your physical condition. Conditions underfoot are generally good but loose scree and rough terrain will be experienced. (maybe with some short sections of scrambling). Late May/June the weather will be hot lower down in the valleys which will add to the difficulty of the trek. Altitude sickness, with the mildest form being acute mountain sickness (AMS) typically occurs only above 2500m. 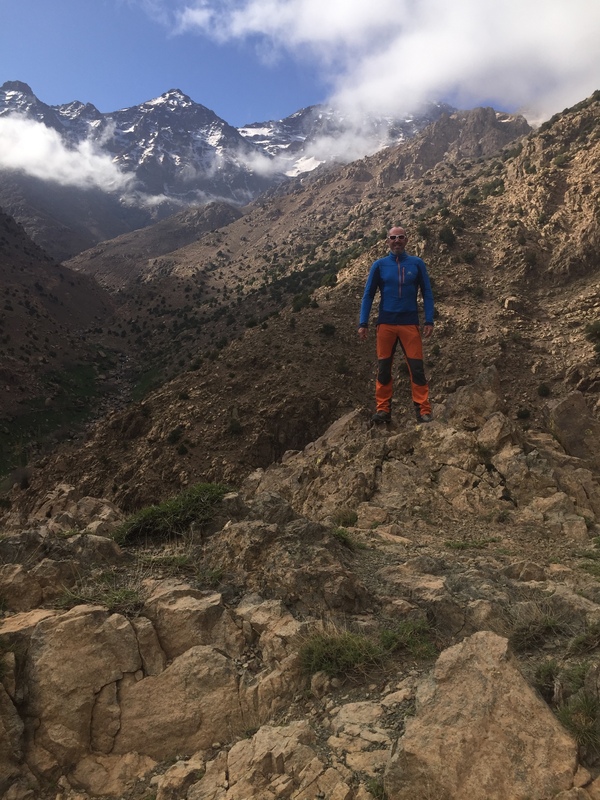 We have designed this 5 day trek to minimize the risk and better aid acclimatisation as we climb above 2500m for our Toubkal summit attempt at 4167m. May/June – Dry and hot conditions with little rain. Marrakech will be hot and temperature will rise to 35Deg C in the daytime. Please note temperatures are from 2018 data and may not be what you experience on your trip. Full price per person excluding international flights. For more details see the ‘What’s Included’ section. Deposit to be paid on booking £150. Please complete the booking form and we will forward payment details. Remainder to be paid no later than 4 March 2020 by BACS transfer. Payment by instalments available on request. To book please click on ‘Find Dates‘ then ‘Book Now’. This will open the booking widget where you can select your dates. Complete your details to secure your place and we will forward a contract and payment details to you.